Teens Encounter Christ (TEC) is a youth retreat sponsored by the Roman Catholic Diocese of Peoria . The experience is based on the Paschal Mystery of Christ. Christ died for us, Christ rose for us, and Christ lives in us and sends us forth with GOOD NEWS of God's Love for us. The weekend includes talks on Faith, Prayer, Reconciliation, Eucharist, Discipleship and Love. There is time for reflection on serious questions of life. This retreat experience offers participants the opportunity of forming Christian Community. On TEC, the message of Christ reaches not only the intellect but also the heart. 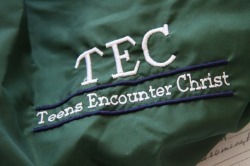 TEC is the common name for Teens Encounter Christ. It originated in Lansing, Michigan in 1965. The program soon spread to many dioceses in the U.S., and came to Peoria in 1973. Since then, over 700 TEC's later, the program has expanded to six regional centers; Peoria, Quad Cities, Peterstown, Bloomington, West Central and Champaign. The TEC program started at Peterstown in 1976. TEC is guided by the diocesan director, a diocesan board, and the six regional boards. The weekends are conducted by teams of lay adults, teenagers, priests, and religious leaders. TEC is intended for young adults aged 16-23 year olds, preferably in their junior year of high school. It is ecumenical in that young people from all Christian faith backgrounds are welcome. Each weekend begins Saturday morning and goes until Monday late afternoon. The weekend is sponsored by the Roman Catholic Diocese of Peoria. The cost for the weekend is currently $50.00, although inability to pay for the weekend should not be a reason for not attending (scholarships are available if needed). It is not a weekend of one sermon after another. It is not just for Catholics. It is not a substitute for a teen's local parish or church. It is not an exclusive religious group. It is not a "retreat" in the traditional use of the word.